Female human fighter 4; Hps 33, AC 17. Sergeant Justin Maltemps heads up Town Unit 6 of the Cauldron City-Guard. She is only a couple years older than (in relative years) our band of fearless adventurers, and has largely grown up with them – acting more as an older sister than anything else. In recent years, Justin has used her position in the City Guard to help look after Gerran, Braenna, Braeden and Kenrik – steering them out of trouble whenever needed. 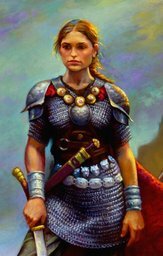 Her unit consists of old Jero Sogley, a thin and quiet man; young and fearless Smit Handrikel; the ever-tired halfling, Tarmy Twobuckles and the enormous but fun-loving prankster, The Glump. But the group did not head home and later rescued the St. Cuthbert acolyte, Rufus, from a beating at the hands of the notorious Thieves Guild known as The Last Laugh. The party captured the would-be-thugs and turned them into Justin's Unit for arrest. Justin was on-hand for the thugs' (actually members of Wall Unit 3) trial the very next day and helped put the men behind bars. She was so impressed by the party's success at breaking up the beating (and their subsequent discovery of some clues to the recent spate of kidnappings) that she deputized the group and commissioned them to follow up on their kidnapping leads. Justin was also present for both the arrest and trial of Khegan Ghelve and has met with Gerran for some late-night drinks at the Tipped Tankard. A most recent development is that The Glump has been promoted out of her unit and now the giagantic lump of flesh is Sergeant of Gate Unit 2. The Glump was replaced by a shockingly dainty half-orc named Umdel.